For many years one of the outstanding golfers in the Midwest, Mrs. Evans won the first of a record nine Peoria City Gold Tournaments in 1922 at the tender age of 16. She won her last city title in 1975 at the age of 58, thus earning the recognition of being the youngest and oldest to hold that coveted honor. She completed her first city tourney at the age of 14 and won her first match before bowing out. Over her long career in the tournament she won over 60 matches. She was medalist of the city tournament six times. In competition around the midwest, she won the Illinois State Women's Senior tournament at Springfield in 1971 and was runner-up in 1972. 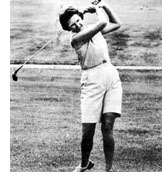 She also won the Southeastern Iowa Women's Amateur tournament in 1953 and 1967 and had been the Mt. Hawley Country Club champion over 20 times.